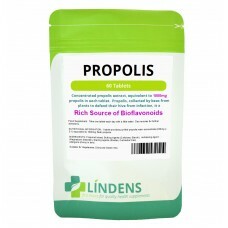 Propolis, a resin collected by bees, is rich in vegetable balsams and resins, and has multiple traditional uses. This item is dispensed in our new "foil-fresh" packaging. This is heat sealed for safety; once opened however the pack is re-sealable to maintain freshness. The foil pack is comprehensively labelled giving instructions for use and a full list of ingredients to meet current UK legislation. Your purchase is sent direct from our dispensary and is posted in a padded envelope that is letterbox-friendly. 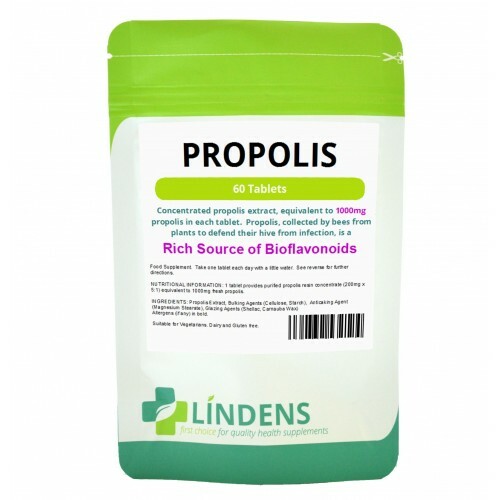 INGREDIENTS: Purified Propolis Extract 2:5:1, Bulking Agent: Microcrystalline Cellulose, Modified Maize Starch, Anti-caking Agent: Magnesium Stearate, Coating: (Shellac, Carnauba Wax). Suitable for vegetarians.